Kadai Vegetable is a combination mixed vegetables cooked with freshly ground spices which gives a nice aroma to the recipe﻿. This is a perfect side dish for roti, naan and pulao. Recently, my sister made this 👆👆(Pic courtesy : My sister) and got appreciations from the family. As I do not eat onions, I just clicked the picture. Punjabi garam masala - 1 tsp. Crushed kasuri methi - 1/2 tsp. Cut capsicum and tomato into cubes, separate cauliflower into florets, cut beans and carrrot to finger long pieces. Cube paneer and immerse in hot water until use. Dry roast and coarsely powder the items given in 'Kadai masala'. Grind ginger and green chillies coarsely without adding water. Heat a teaspoon of oil in a kadai, sauté capsicum with a pinch of salt in high flame for 2 minutes, remove from pan and keep aside. (If you use onions, you can add 1 sliced onion alongwith capsicum). Heat butter and oil in the same kadai, and add ginger-green chilli paste, and sauté until raw smell diffuses, add veggies and saute in medium heat. Add salt, turmeric, coriander, cumin and red chilli powder. Cook covered until half done. Sprinkle little water if necessary. Add cubed tomatoes and 'kadai masala', mix well and cook covered until done. 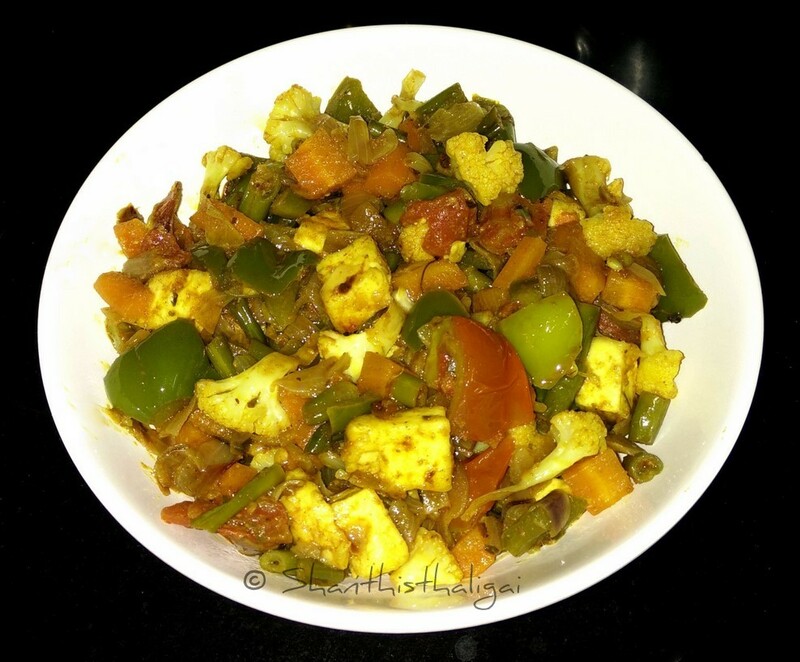 Now add already sauteed capsicum, cubed paneer, punjabi garam masala, mix well. Cover the pan and cook for 2 more minutes. Add kasuri methi, chopped coriander leaves, mix and serve hot with any Indian flat bread or pulao. NOTE: You can add more of any spices to suit your tastebuds.